I saw something similar to this on Pinterest. 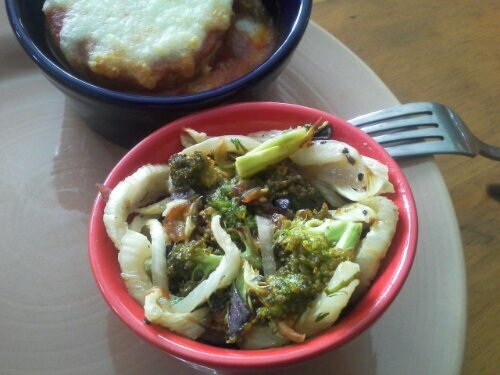 I forget what I was actually looking for, but I did have both broccoli and fennel that I needed to use up. My broccoli was starting to turn a funky -uh- yellow and the fennel had just been rolling around in the vegetable for far too long. I like to use Pinterest, but it still doesn’t have enough users, or something else is wrong, because it is hard to find what I want exactly. So I did find a fussy recipe. What I mean by fussy, is that they seriously expected me to cut up the broccoli, oil it, season it, then place it on a tray and roast it. Then they wanted me to cut up the fennel, oil it, season it, and put it on its own tray to roast. For different amounts of time. Nah, nah, nah. 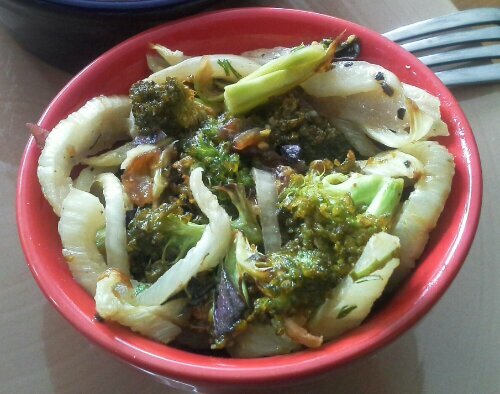 I just cut the fennel a little thinner tossed both veggies in a bowl and roasted them together. Simple. I also (horrors! ) used bottle vinaigrette. I am soooo baaad. Cut the broccoli into smallish, bite-sized florets. Trim any stems that are tender and slice them thin. Place in a medium bowl. Cut the green fronds off the fennel and slice the bulb into 1/4-inch slices. Toss them in the bowl also. Cut the onion into wedges and – you guessed it – bowl. Drizzle the oil over the vegetables in the bowl, then season with salt and pepper. Toss to distribute (I use my hands). Turn the vegetables out onto a baking sheet and spread out in a single layer. Roast until tender. The edges will be starting to brown, about 15 minutes. Let cool slightly, then place in a clean bowl with herbs and vinaigrette. Toss.